Did you know that those harmless looking “Dust Bunnies” could be harmful to your health? Have you ever done some cleaning and noticed little balls of dust under the couch, behind the furniture, or even hiding out near the laundry dryer? It’s just a collection of lint and dead skin cells, no big deal, right? Heck, with people calling them cute names like “dust bunnies” it’s easy to believe they’re virtually harmless. That’s what I used to believe, anyhow, but now I see them as vicious creatures set out to destroy me! Okay, maybe not so much, but here’s some motivation for keeping your home clean. Research from Duke University found that dust bunnies are more than a collection of lint and skin. In every single house the researchers tested, there were deadly chemicals mixed with the dust bunnies, chief among them being some fire retardants – chemicals that protect against fire. They claimed that there were more chemicals concentrated in dust bunnies than even sewage sludge! Yuck. Where do these harmful chemicals even come from? The dusty rabbit outlaws can be found in bandit hideouts beneath furniture, electronics, and insulation (the part of the house used to keep the air fresh in the summer and warm in the winter). Flame retardants are put on these products to stop them from lighting up quickly in the event of a fire. If only we could light those long-eared monsters on fire! The researchers found that many of these chemicals were found lurking inside people as well! According to the researchers, just about all Americans have flame retardants in their bodies. Hmmm… but if flame retardants protect against flames, does that make us slightly fireproof? Not in the slightest. There is a type of flame retardant called Polybrominated diphenyl ethers (PBDE) that looks very similar to normal chemicals that are supposed to be in our bodies – like the kind that help with brain development and metabolism in adults. However, just like those pesky dust bunnies, they’re just blending in. Long-term studies have shown that individuals with high amounts of PBDE tend to have problems with paying attention, moving their bodies, and learning. Yikes, that’s serious. Dust bunnies don’t seem so cute anymore do they? Like I said, they are vicious creatures, and should probably be called dust “demons.” Who would have thought vacuuming could be a lifesaver? 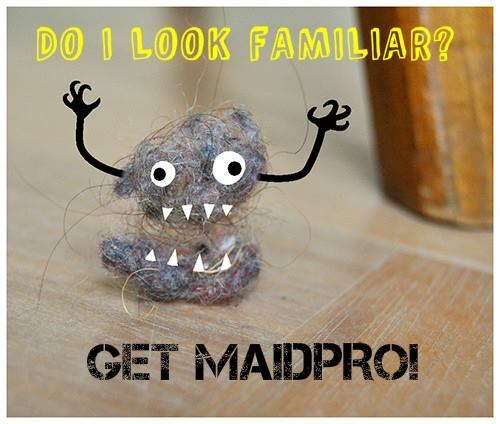 If your vacuum is not working or you want to call in the professionals, contact MaidPro. Our”Pro’s” will eradicate those pesky “Dust Bunnies” and leave you home clean and healthy.